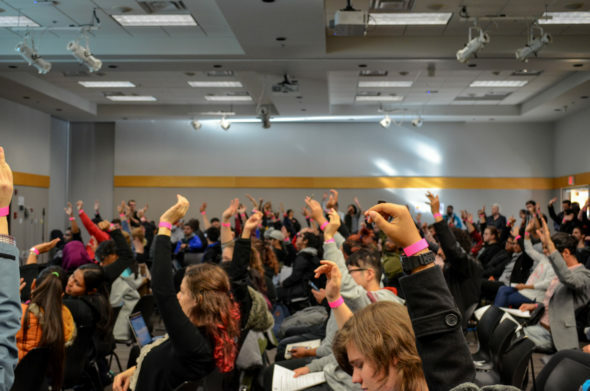 The Kwantlen Student Association is set to implement a new set of bylaws after its members voted to approve them at a special general meeting held on Nov. 14. KSA directors, staff, and START volunteers were present on both the Surrey and Richmond campuses to help register and count KPU students for the vote. Food was served and several prizes were given away, including a $2,000 tuition waiver. Members of the KSA Executive Committee had been planning the meeting for months beforehand, emphasizing its importance to the continued operation of the association. The SGM marked the KSA’s last chance to update its bylaws in accordance with the BC Societies Act before the Nov. 28 deadline. The Societies Act replaced the similarly named Society Act in November of 2016, and all not-for-profit organizations in the province were given two years to update their bylaws in compliance of the new Act. Prior to the meeting, the KSA bylaws had not been changed since 2011, despite multiple unsuccessful attempts to reach quorum at previous general meetings. 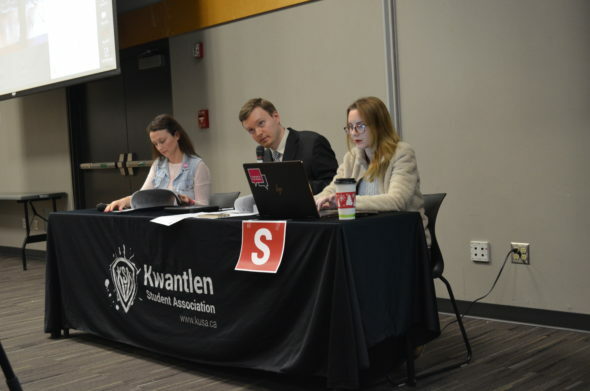 At the meeting, the KSA handed out summary packages which outlined the major proposed changes to the bylaws as well as several minor alterations, such as the removal of gendered language throughout the documents. Other notable changes include lowering the required quorum for changing the constitution or bylaws from 200 to 150, removing bylaws pertaining to the association’s ombudsperson position, and updating the titles of executives. The new bylaws have also eliminated faculty representative positions which do not have a program that lasts for at least 12 months. This includes the Trades and Technology Faculty Representative position. VP University Affairs Murdoch de Mooy says that, because of the short length of the trades programs, councillors who are elected are not able to serve terms longer than six or eight months. Coupled with the time requirements of tech programs, this has led to a long-standing vacancy in the representative position. Because this change was made before the new two-year Mechatronics program was created, there can still technically be a seat open on KSA Council for a Trades and Tech Representative. However, it will be limited to students in programs like mechatronics, which last for at least a year. De Mooy adds that the removal of bylaws pertaining to an Ombudsperson does not prevent a position from being created or filled in the future. It only stops the KSA from being compelled by law to do so. Another bylaw change will allow the KSA to join external organizations while still allowing them to function “on our own terms,” which will help the society in negotiations if membership contracts change over time, according to de Mooy. The KSA also passed a motion ensuring that former youth in care will no longer have to pay fees to the association. Since September 2017, all post-secondary institutions in B.C. have been offering tuition waivers to young people who were in foster care, and this motion and an accompanying change in the bylaws ensures that they can be exempt from paying fees to the KSA as well. Finally, in order to meet one of the new requirements of the BC Societies Act, the KSA incorporated the councillor honorariums from the society’s regulations into the bylaws themselves. Topics raised by student speakers at the meeting were focused on making sure that the KSA remains accountable. 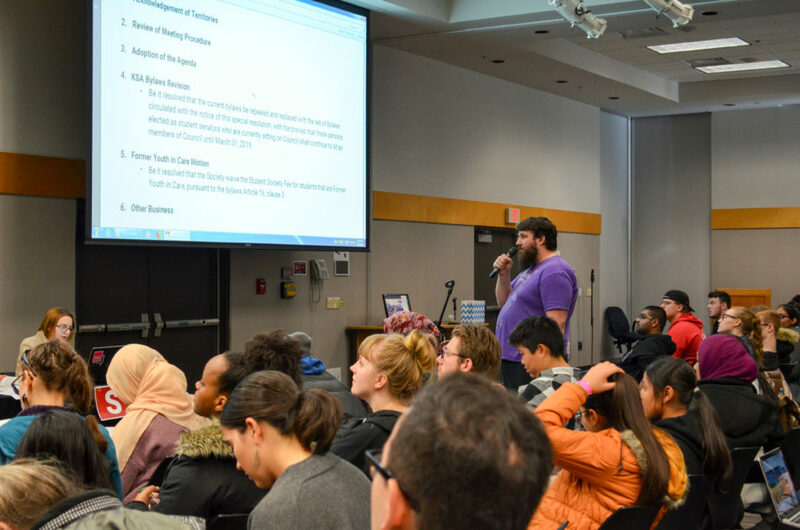 Students expressed concerns that KSA representatives could alter the amounts of the stipends and honorariums they receive in compensation for attending meetings and working on their portfolio. Currently, the KSA’s regulations grant a $75 honorarium to councillors for attending regular-scheduled and special council meetings to a maximum of six meetings per semester, or $450. There are four regular-scheduled meetings per semester. Representatives who also serve on standing committees like the those for governance, student life, or environmental sustainability receive additional $50 honoraria for attendance to a maximum of five meetings per semester, or $250. Members of the KSA Executive Committee, however, are excluded from receiving all attendance-based honoraria, and are instead paid through bi-weekly stipends of $1,273.69, or $2547.38 per month. The attendance-based honoraria regulations were originally implemented in 2013 by Director of External Affairs Arzo Ansary and Director of Finance Tony Chiao, and the amounts have not been amended since then. At the KSA’s March 2018 council meeting, members carried a motion that tied the executives’ stipends to CPI inflation, though it stipulates that the amount must be reviewed every three years at a minimum. McCutchen, Thorpe, and Piraquive excused themselves from the vote to avoid a conflict of interest. Thorpe says that the amounts listed in the updated bylaws can only be changed through student membership approval at future general meetings. He adds that he is investigating other payment models which compensate councillors more proportionately for the work they do for students, similar to those used by the Capilano Student Union. The KSA executives say that they can now focus on planning events and preparing for the referendum to join the Canadian Alliance of Student Associations that they will be holding in the spring.